Since yesterday was smoothie Monday and well as you may know I didn’t post a smoothie recipe, so I thought, why not post one today? After all I think you can have a smoothie anytime of the day or week. So as a special treat I made one delicious smoothie that tastes like a milkshake. This is my Peanut Butter Banana Chocolate Chip Smoothie. I have to say Oh My Gawd! This smoothie is amazing! It really does tastes like a milkshake. 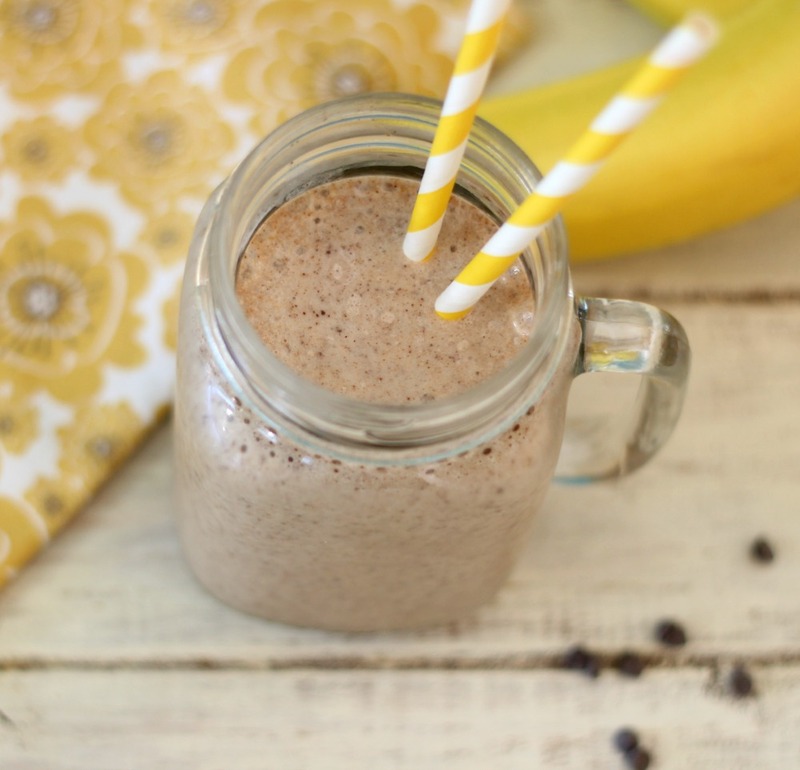 It’s creamy, cold, a wonderful banana flavor with a hint of peanut butter and little tidbits of chocolate chips. 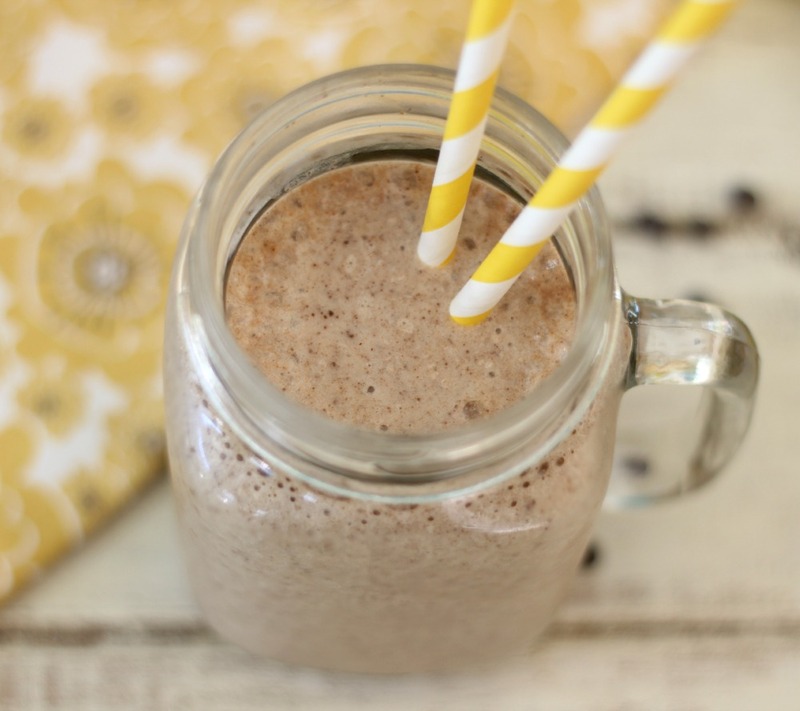 This is a perfect substitute for a milkshake and way healthier! I think I could drink this smoothie everyday! It’s also so refreshing, perfect for breakfast, lunch or dinner! 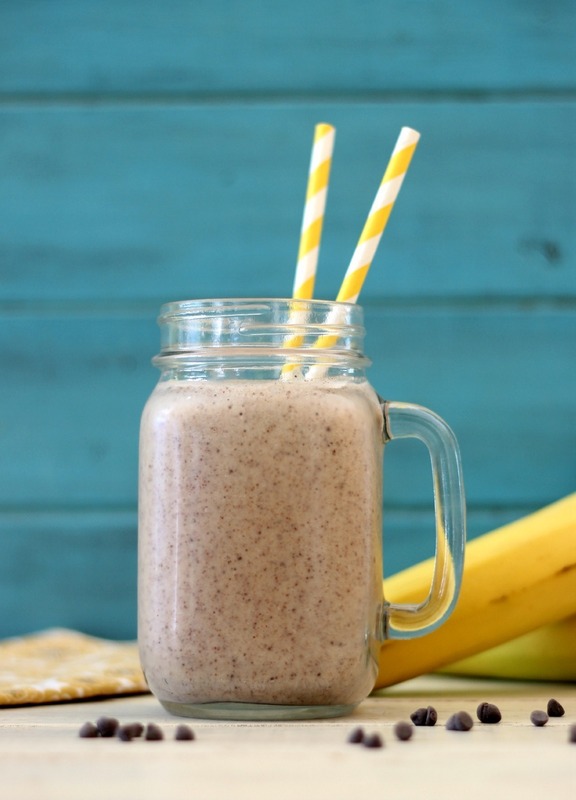 A creamy, thick smoothie that tastes like a milkshake and is made with frozen bananas, peanut butter and little chocolate tidbits. Add banana, peanut butter and milk in a blender, process until smooth. Add chocolate chips and process until well blended. This smoothie makes for two cups, and if you wanted to, you could share, but you know what? I didn’t! It’s just simply an amazing simple smoothie! 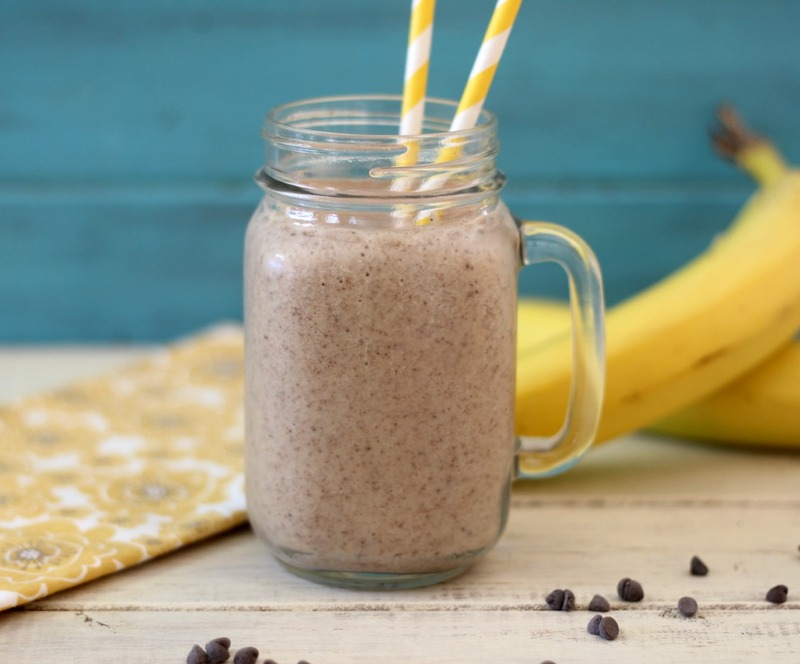 It’s also loaded with so much potassium that it makes for a great post workout smoothie! It has protein, healthy fat and vitamins and minerals. So I highly recommend this smoothie, especially on warm summer days! I want to take down the entire mug. This looks wonderful! Ha Ha! Thanks Jennie! Yes I drank the whole mug worth! It’s just amazing! I’m new to this way of eating. If I wanted to, could I put some seeds of some sort into it? If so, what would you recommend? Thanks! Hi Michelle! I like flax seed or chia seeds in my smoothies. They add a nice boost of fiber and protein. This looks so good and a great way to use the rice milk I just bought. A while you ago you mentioned about going dairy-free, well, rice milk is awesome!!! It’s non-GMO, vegan, Gluten free, and so much more. I’m really picky when I have something other than regular milk, so here’s what I really like bout it: it actually tastes like normal milk!!! The only difference is that it’s a bit thinner, but the taste is the same. You can bake with it and use it for puddings and so much more. This has been a huge life saver for me as I can now enjoy products that are heavy in diary without all the congestion and other problems that I have along with it. I highly recommend this product!! Thanks Samantha! I have to admit I never had rice milk, but I’ll pick some up at the store next time I go. I am curious to how it tastes. Thank you so much! Hope your feeling better! You make the BEST smoothies. If you ever get the pink slip at work, you could definitely open your own smoothie shop and make a killing with all your creative, delicious versions! BTW, I LOVE your state! We’re in Pismo Beach right now over looking the ocean. It’s just spectacular! Thank you so much Chris! It would be fun to open a smoothie shop. Oh I just love Pismo Beach! I haven’t been there in so long! Have fun and enjoy yourself. I just made this and all I can say is YUM! I was bad and put alil more chocolate chips in mine but it’s literally amazing and filling. So glad I found this recipe! Thank you!